Banbridge U18’s entertained Rainey U18’s this week and it was a real top of the table clash with Bann in first position and Rainey in second place in the league. With so much at stake Bann needed to be at their best to get points from the game. Bann started strongly and the forwards were breaking the gain line to set up good attacking positions for their backline. Both Bann centres, Robin Sinton and Cameron Cromie, were able to carry the ball with real strength and purpose. However, against the run of play it was Rainey who opened the scoring when their winger took the ball out wide and was able to touch down in the corner. The conversion was unsuccessful. Bann were spurred on by this score against them and with Andrew Jackson, RJ Greenlee and Ross Haughey taking the ball forward to Rainey they were breaking the gain line time after time. Bann had the majority of the possession and were working well in their pack. Alex Megaw was all over the pitch supporting both backs and forwards equally. They were able to supply good go-forward ball to the backs where Sinton was looking dangerous with his power and pace. Indeed when Andrew Jackson made a break into the Rainey half and set up a ruck, Josh Cromie fed Sinton who out-paced his opposite number and was only tackled five metres short by the scrambling defence. Sinton was still able to off-load to centre partner Cameron Cromie who drove over to score the equalising try. Walker was unsuccessful with the conversion. 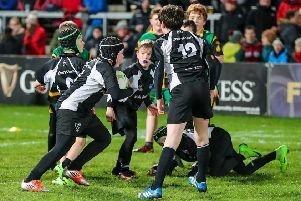 Weather conditions became very difficult when heavy snow started to fall but it was Bann who adapted the better of the two teams to the elements and really improved their ability to keep possession in both the forwards and backs. Cameron Cromie broke away and when tackled ten metres out, the ball was quickly re-cycled through Josh Cromie. He fed Walker going on the blind side, and the out-half was able to draw the opposition winger and set Keelan McCambridge off on a sprint to the corner, giving Bann a 10-5 lead going into the second half. Bann now had the wind against them and needed to minimise opposition possession to deal with the elements. Bann were now playing their best rugby of the season so far and all forwards and backs were inter-linking play successfully. Matthew Taylor, Robin Hewitt, Jake Dennison and Matthew Blain were all putting in a strong shift both in rucking and carries. All this hard work meant that Rainey were being starved of any worthwhile possession and all the pressure was coming from the Bann side. The pressure told when Josh Cromie took a quick tap-penalty and outpaced any would-be defender to score. The final Bann try was scored following phase after phase of re-cycled ruck ball by backs and forwards alike. Curtis Jackson used his considerable power and pace to drive over for a fourth unconverted try which left his side still sitting on top of the table.